After my diagnosis of arthritis, I started looking for ways to reduce inflammation without having to take meds. And yes, I'm finding out what my dietary triggers are - too much sugar, too much dairy, too much bread, and too much processed food. 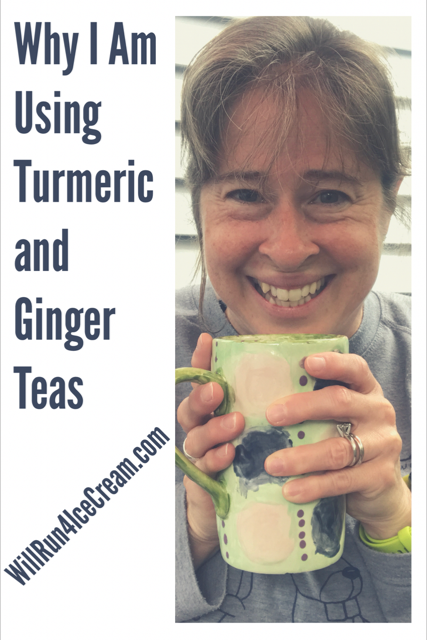 I had heard that turmeric and ginger were also great to help reduce inflammation. I love tea. So instead of taking a supplement, I decided to try tea instead. turmeric and ginger tea daily. I've been putting both bags into one cup, and I drink it first thing in the morning (mainly so I won't forget). My favorite way to drink it is iced. After it steeps, I pour it over ice. But lately, I've just been drinking it hot since I'm short on time. It's good both ways. And for me, it makes a big difference. If you are dealing with inflammation, I encourage you to give it a try. If you aren't a tea drinker, they also make various supplements. A simple google search will find you lots of options. Or if you are an amazon shopper, you can check this out for turmeric and this for ginger. I noticed a difference within a few days. I mean it's not a miracle cure. Yes I still have inflammation, and no I can't eat an entire pizza and think that turmeric and ginger will keep the inflammation at bay. But, from my personal experience, I can tell you that it's like night and day for me. So it's definitely worth it for me. What about you? Do you use or know of any natural ways to help fight inflammation? If so, drop me a line in the comments or reach out to me on social media! I drink the numeric tea from Republic of Tea and I love it! I was diagnosed with arthritis in my knees last year and Chiroflex by Total Tea made a HUGE difference. I feel like it's what got me back to running. It has curcumin in it which is also a natural anti-inflammatory. And most recently I started adding TLC Seasonings Inflammation Buster seasoning in my morning coffee or my oats. Yummy and also helps with inflammation. I'm with you on looking for those natural ways to beat inflammation rather than living on ibuprofen! I tried curcumin but didn't find it helped. Best anti-inflammatory for me has always been exercise. I rarely take Osteo Panadol (maybe once a fortnight on average). I can't take NSAIDs due to gastrointestinal issues. I am on DMARDs of course. I take fish oil like crazy! Pain, luckily in some respects, has not been my worst problem. Fatique and brain fog shocking. I am losing manual dexterity, but even so, hand pain in minimal.